We hold to the doctrinal belief that there is only ONE being that’s the omniscient, all-powerful creator. And, that’s all true in Biblical theology, but that is not communicated in a single specific term in the way in which we have become accustomed to using the term. We see G, O, and D, and we automatically assign a specific set of attributes to the term, but ancient writers of the Old Testament didn’t view the terminology in our modern-day context. In his book, The Unseen Realm, Dr. Heiser methodically walks the reader step by step through an ancient Israelite’s perspective of the Old Testament text. If your defensive shields just went on full alert, and you’re ready to click away in repugnance, then you’re in the same place that I was, with my modern-day filter system firmly in place. And, which is more, you’re misunderstanding the assertion. The misunderstanding is a result of the reactive default implications that are courtesy of those very filters. Take a breath and please keep reading. Bible students at every level of scholarship from recent convert to seasoned theologian are guilty at times of interpreting the text through a myriad of modern-day filters that we don’t even realize are in place. Is it proper to interpret the scriptures in light of the teachings of revered Bible scholars? of the leaders of The Reformation? or even the early church fathers? Dr. Heiser states that the real payoff is in looking at the scriptures through the context of those who produced it – the perspective and understanding of the Ancient Israelites. How did the patriarchs: Moses, Joshua, Abraham, Isaac, and the prophets, understand the revelation of the Creator to his creation? Collectively, they answer that very question for us repeatedly throughout the Old Testament text. Starting with an investigation of Psalm 82 in the original text as parsed through the underpinnings that are woven throughout the Old Testament text, Dr. Heiser takes the reader on a systematic journey through the very passages that are so familiar, yet so glossed over. What is there, waiting to be seen, that we casually read past due to our modern-day interpretational filter system? Are we really seeing what the text actually says? Or, are we seeing the meaning that we have carelessly superimposed upon the passage and missing something richer that brings light to a more complete picture of God’s relationship with his chosen people? The Unseen Realm opens a window of understanding that will put the Old Testament scriptures and the entire fabric of the Biblical message in a new light. 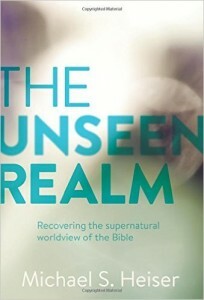 Other than The Bible itself, The Unseen Realm is perhaps the most important book that I have read in many, many years. Having been introduced to the underlying message, I am now rediscovering much of the Old Testament scriptures for the first time. That’s a bold statement, but an honest one. I could continue to write paragraph after paragraph, detailing the experience, but my recent interview with Dr. Heiser was designed to do that very thing. It’s about an hour in length and it not only underlines the foundation of the book itself, but also digs into several of the key terms and manifestations of The Most High in the Old Testament Text. Listen to the interview here: Shedding Light on the Unseen Realm.